This is a test score analysis program. The data to be input in to the system is read from a text file called testcores.txt. The program calculates the average (arithmetic mean), median, and mode, and prints a histogram to present the frequencies of the test scores data. 1 The code to display average (arithmetic mean), median, mode, histogram to present the test score data set is written in the showOutput method. 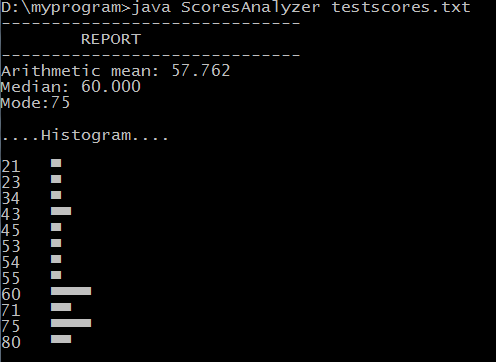 2 The getData method reads the test scores from the testscores.txt file and place those scores in the data array. 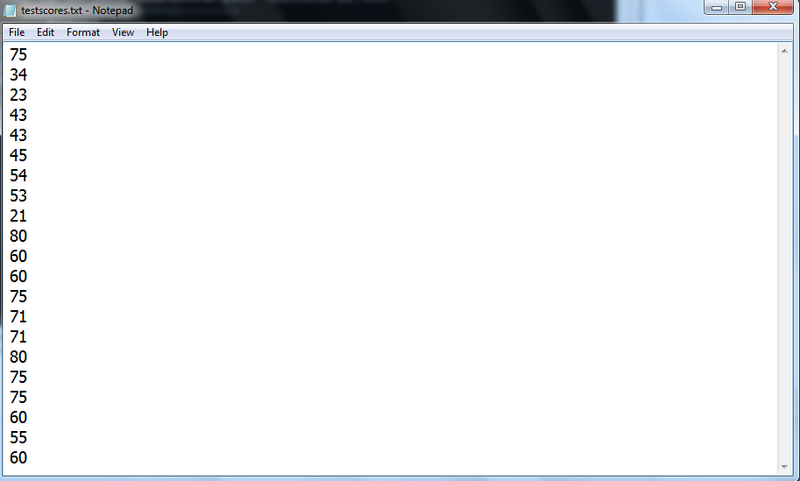 The File class is used to get access to the testscores.txt file. The File class has the length() to return the size of the file. Based on the size of the file, we can correctly determine the size of the data array that is used to received data from the file. To read the data line by line, you will need to use the BufferedReader class and pass the FileReader object to the BufferedReader constructor argument when creating BufferedReader object. 3 The getFreq method computes the frequencies of test scores in the data array. The computation is simple. You need to use the elements of the data array as the indexes of the freq array. The for loop is used to iterate through the data array and increase the freq array by one at the each index. 4 The findmax method is used to find the maximum item of a collection or array. This method is invoked in the getMode and getFreq method. In getMode method, is used to return the maximum frequency in the freq array. In the getFreq method, the findmax method is used to find the maximum element of the data array to determine the size of the freq array. 5 The getMean method returns the arithmetic mean of the test scores. It is calculated by dividing the total score by the size or number of the data items in the set. 6 The getMedian method returns the score that is the median of the data set. To correctly calculate the median, the data set must be sorted in either ascending or descending order. If the number of data items is odd, the median is the item at the index n/2. If it is even, the median is average of the two middle data items (data[n/2-1] and data[n/2]). 7 The getMode method returns the test score that is the mode of the data set. A mode is a data value that has the most freqency in the data set. 8 The sortData method sorts the data set in ascending order. The sort algorithm used here is selection sort algorithm. 9 The printHistogram method defines code to display a histogram to present the frequencies of the test scores. Well learning programming langauges has a braoder scope now than usually in the past. Lets focus on college-paper.org reviews where the tips and tutorials are provided which will help in understanding the given information and articulate cetain aspects related to these codes.